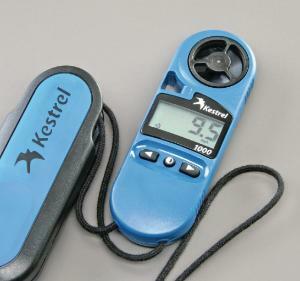 You can carry this little wind meter in a pocket and hold it in one hand when you need to take a measurement. It features a large liquid crystal display and allows you to choose between three modes. Current wind speed, average wind speed, and maximum wind speed can all be measured at any time in one of five standard measurements. The impeller mechanism is shock–mounted in a glass–reinforced plastic housing that can be popped out and replaced in the event that the mechanism becomes worn or damaged. It is also waterproof up to 1 m and floats.